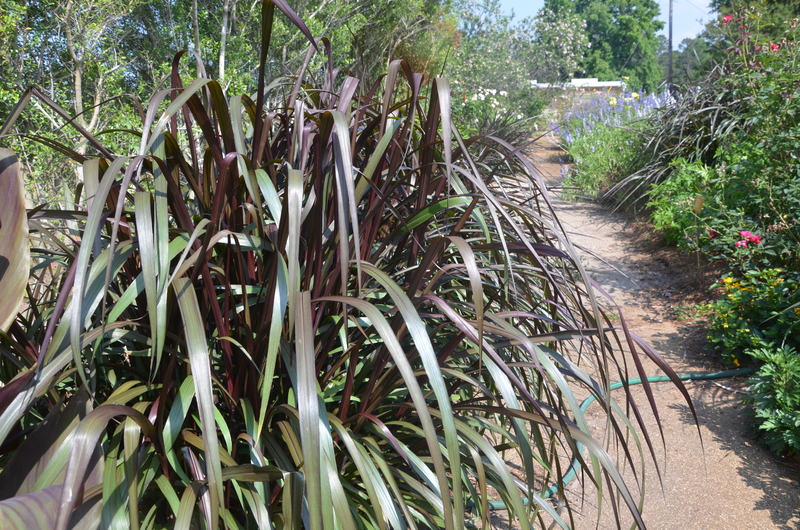 COLLEGE STATION – Like true royalty, Princess Caroline Napier grass is beautiful and elegant in its own right, while bringing out the best in its companions, according to a professor of ornamental horticulture. Texas Superstar plants undergo extensive tests throughout the state by Texas A&M AgriLife Research and Texas A&M AgriLife Extension Service horticulturists, said Dr. Brent Pemberton, AgriLife Research horticulturist and chair of the Texas Superstar executive board, Overton. To be designated a Texas Superstar, a plant must not just be beautiful but also perform well for consumers and growers throughout Texas. Superstars must also be easy to propagate, which should ensure the plants are not only widely available throughout Texas, but also reasonably priced. McKenney was previously with AgriLife Research and AgriLife Extension at the Texas A&M AgriLife Research and Extension Center at Dallas. In 2006 she returned to Texas Tech but remained on the board “to perform planting trials in the South Plains of Texas, thus providing a semiarid Texas Superstar test site with a wider range of both high and low temperatures due to the elevation,” she said. McKenney’s trials in the Lubbock area found that Princess Caroline is not a dependable perennial in U.S. Department of Agriculture’s plant hardiness zones six and seven, which includes the Panhandle and parts of the South Plains and Rolling Plains regions. “So in Lubbock and other areas, Princess Caroline would best be treated as an annual, but it grows so fast, you’ll still have the full height of the plant early in the season,” McKenney said. In most of the state, the roots will survive — even after freezes kill the plant to the ground — and will grow back in the spring without replanting, she noted. Princess Caroline fills the requirements for Texas Superstar for a number of reasons, according to McKenney. The plant grows 4- to 6-feet tall, depending on amount of water it’s given and length of the growing season. “Its rapid growth and bold appearance makes it a showstopper in any planting,” she said. Seventeen varieties of Napier grass were tested throughout the state before choosing Princess Caroline, McKenney said. The plant is a recently developed Napier grass variety which is a tri-specific Pennisetum hybrid, which means it was crossed with three Pennisetum varieties, P. purpureum, P. glaucum, and P. squamulatum, at a University of Georgia breeding program. Unlike its predecessors ‘Prince’ and ‘Princess,’ which were bi-specific hybrids, Princess Caroline is resistant to leaf spot disease and is very heat and drought tolerant, according to the official Texas Superstar board description. But the official description doesn’t do justice to the beauty Princess Caroline can bring to a home landscape, McKenney said. “The foliage is a nice purple color, and that’s one of the features many homeowners enjoy because then you can put some orange or yellow flowers in front of it and get some really stark contrast,” she said. Because Princess Caroline is a fairly large plant, gardeners will want to cluster several in a location, about 3 feet apart, she noted. It does best with limited fertilizer. McKenney said Princess Caroline should be widely available throughout the state thanks to Texas Superstar promotions to commercial bedding plant growers and outlets. “Including Princess Caroline in your garden should make a significant statement that won’t cost you very much time or money,” she said. Texas Superstar is a registered trademark owned by AgriLife Research. More information about the Texas Superstar program can be found at http://www.texassuperstar.com/.